For quantity discounts on 10 or more units, please call 323-293-5861. Some books have been translated into Spanish and other languages. Please call for details. All books are personally autographed by Deborah! This book is a guide for women to evaluate their current financial standing, set goals for the future, take charge of their spending, and approach relationships with financial wisdom–and for those who want to make well-informed financial choices to improve the quality of their lives. 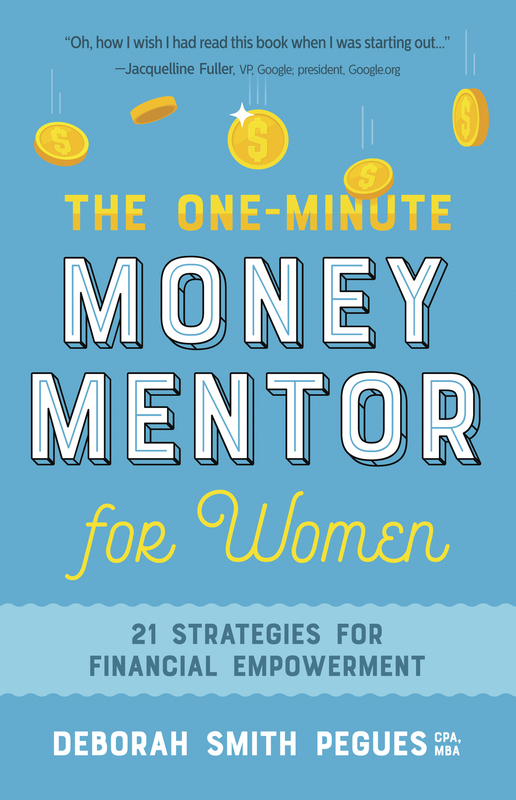 The One-Minute Money Mentor for Women will empower readers to take charge of their money and conquer the bad habits, fears, and uncertainties that threaten their economic stability and peace of mind. Sometimes stress causes us to miss out on the rest, fun, and health we long for. Chock full of personal insight and experience, this book teaches you how to: Identify Your Stressors, Evaluate Your Expectations, Release Your Tension, Solidify Your Support System, Enjoy the Present, and even change your “stress confessions”. Read it and Relax! This book is a crash course in becoming “trans-social”, i.e., having the ability to flow confidently in every social environment. Deborah shows you how to make proper introductions with confidence, interact with diverse groups of people with grace and wisdom, and host events, dinners, and business meetings with charm and ease. From networking to traveling, to making small talk to tipping, this is your guide to personal and professional polish. Featuring real stories of people who triumphed over unforgiveness (and those who did not), this book debunks the myths of what forgiveness is and what it’s not, how to overcome seemingly unforgivable hurts, when to restore, redefine, or release a hurtful relationship, how to forgive without forgetting, a 12-Step Forgiveness strategy, and 20 Scripture-based prayers to overcome specific offenses. Get ready to disconnect from your negative past! This is a non-preachy guide that uses principles and promises from Scripture to help readers move from the valley of self-doubt to the highway of Supreme confidence. Sections of the book discuss the Seven Syndromes of Insecurity, Roadblocks to Supreme Confidence, Strategies for Conquering the Giant of Insecurity, and the Seven Habits of Emotionally Secure People. Cautioning that self-confidence is a “worldly”concept, she invites men and women to “show up” for the challenges that will get them on the road to personal fulfillment and their Divine destiny. Parents and other child influencers need the wisdom of God to produce well-behaved but expressive children. From teaching them to speak respectfully to adults to expressing their anger appropriately, this fun, functional, Bible-based book is chock full of practical tips on coaching kids to become positive, polite, and powerful communicators! Attitude is everything! This wisdom collection provides a menu of mindsets one must embrace in order to experience a high quality of life and to enjoy the journey. You will be challenged to choose to: accept others, welcome change, relinquish control, pursue excellence, be an optimist, live with passion, and much more. Your “mindset” will change as you learn to “set your mind” on the right track! Use this powerful guide to find the right path to a new outlook! This is an indispensable guide for dealing with short-term and long-term feelings of displeasure. Asserting that anger is a secondary emotion, Deborah helps readers identify 18 primary emotions that may be at the root of their anger–and discloses practical anger-taming strategies for triumphing over each one. She also sheds light on non-emotional causes of anger such as certain foods, environmental influences, and brain chemical imbalances. The book features heart-searching personal challenges and powerful affirmations that point you to a new sense of freedom and improved relationships. 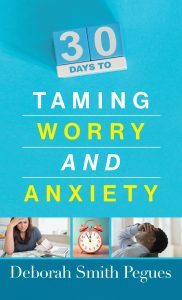 This book is a consolidation of 3 books: 30 Days to Taming Your Stress; Choose Your Attitude, Change Your Life; and 30 Days to a Stronger, More Confident You. It contains 90 practical tips that will help you discover the calm, confident, caring you all in one volume and at a huge savings. With her trademark clarity and practical wisdom, the author addresses 30 of today’s major fears with godly principles and straightforward helps. This books gives readers power over fear by helping them understand the foundation of their fears; God’s perspective on their specific anxiety, fear, or phobia; how to respond to fear triggers with information, awareness, and confidence; ways to embrace healthy fears and to resist unhealthy ones; and how neutralizing their fears maximizes their life. This book highlights real-life dumb choices of ordinary people and biblical characters, explores 10 emotions (e.g., pride, lust, guilt, etc.) that drive such choices, and reveals seven secrets for making great decisions. The principles, stories, prayers found in this book will give you the tools and confidence to make smart choices in your personal and professional life. This powerful, biblically-based book on how to confront interpersonal conflicts at work, at home, at church, and at play is written for those who have been hurt, offended or negatively impacted by someone’s behavior. It provides guidance for those who are afraid to confront, those who often confront with hostility — and for those who are stuck in un-forgiveness. It presents a clear path to relational freedom as you explore the fears and needs of four distinct personality temperaments. This easy-to-read book features more than 100 brief, immediate, and heartfelt prayers addressing many of life’s biggest challenges: anger, loneliness, life-threatening illnesses, addiction, divorce, betrayal, debts, binding contracts, imminent death and much more. In every circumstance, readers will learn to declare Scripture in the form of prayer and exchange despair for hope, uncertainty for truth, and anxiety for peace-assured that God hears their cry and is faithful to respond. Try 30 days of boot-camp with one of America’s most respected CPA’s, and watch your financial health improve dramatically. The reading is easy but the advice is no-nonsense; it includes: tips on how to develop a spending plan, improve your FICO score, beat the debt trap, profit from your passion, and much more. This concise, to-the-point mini-book will revolutionize anyone’s conversation! It highlights 30 negative uses of the tongue and challenges individuals to “fast” or abstain from such use for a 30-day period. A daily assessment checklist keeps readers focused on the goal of developing a wholesome tongue. Through penetrating questions, practical exercises, and thought-provoking Scriptures, this companion, interactive 30-day workbook will help you establish God’s Word in your heart and root out impure motives that keep the words of your mouth from becoming acceptable in God’s sight. Excellent for personal or group study. Time to glorify God in your body! 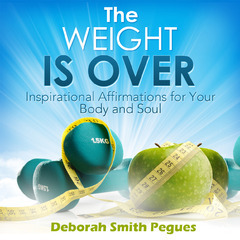 This CD includes over 80 affirmations on eating, exercise, sleep/rest, emotions, and body image—plus anointed prayers–set in a backdrop of relaxing music and nature sounds. All designed to motivate you to achieve and maintain God’s ideal weight for YOU. Learn how to declare and decree your victory! Couples, learn how to move from being “financial enemies” to enjoying “financial intimacy”. Deborah shares her wisdom on how to have the “financial talk” before and after marriage, how to understand your mate’s money personality, align your financial goals, manage your credit, and get your house in order as a couple. In addition to the 3 audio files, this landmark teaching series also includes a 50-page Workbook complete with steps, tips, revealing quizzes, resource lists, and forms—all designed to bring you and your mate into financial harmony. – Calming Scriptures & Prayers with Sounds of Nature; a healing balm for the stressful soul. A dynamic message recorded live! Powerful and practical teaching on moving from insecurity to Supreme confidence. Couples, learn how to move from being “financial enemies” to enjoying “financial intimacy”. Deborah shares her wisdom on how to have the “financial talk” before and after marriage, how to understand your mate’s money personality, align your financial goals, manage your credit, and get your house in order as a couple. In addition to the 3 audio files, this landmark teaching series also includes a 40-page PDF workbook full of steps, tips, resource lists, revealing quizzes, and forms—all designed to bring you and your mate into financial harmony. Complete prayer appears on front and back. 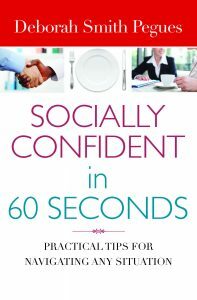 A must for those desiring social confidence and a polished image! Drawing from her bestselling book 30 Days to Taming Your Tongue, Deborah shares effective ways to exchange destructive language for productive communication in this insightful DVD series. With engaging personal stories, impactful/humorous skits, and her trademark directness, Deborah presents six biblically based, 30-minute sessions. She shares how viewers can embrace a life-changing outlook, purpose, and faith when they release their: lying for a life of integrity, criticism to encourage others, gossip and use words of healing, complaints to welcome contentment, retaliation and allow forgiveness, and doubt to hold onto hope.